Mary L. (Hodges) Wert, 80, of Goshen died early Saturday morning, May 28, 2016 at IU Health Goshen Hospital. She was born June 14, 1935 in Tuckerman, Arkansas to Dan and Sarah (Winemiller) Jarrett. 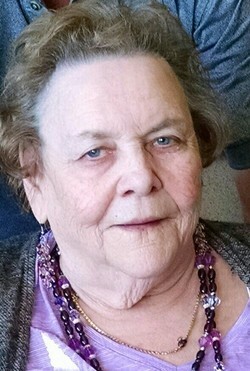 She is survived by a daughter, Danette Hunter of Goshen; three sons, Thomas Jarrett of Kansas, Daniel (Kristi) Balentine of Elkhart and Robert (Merrie) Balentine of Goshen; daughter-in-law, Janet Balentine of Goshen; nine grandchildren; 17 great-grandchildren; a sister, Linda (John) Carpenter of Elkhart; and two brothers, Larry (Kim) Jarrett of Valparaiso and Leroy (Maxine) Jarrett of Arkansas. Along with her parents, she was preceded in death by four brothers, Gerald Ray, Paul, Norman and Bill Jarrett. Mary was a member of the Church of Christ, Goshen. She enjoyed painting, singing, gardening, cooking great food and spending time with family. Friends may call Wednesday, June 1, 2016 one hour prior to the 1:30 p.m. funeral service at Yoder-Culp Funeral Home. Minister Brad Price will officiate. Burial will follow in Violett Cemetery, Goshen. In lieu of flowers memorial contributions may be directed to Yoder-Culp Funeral Home to assist the family with funeral expenses.